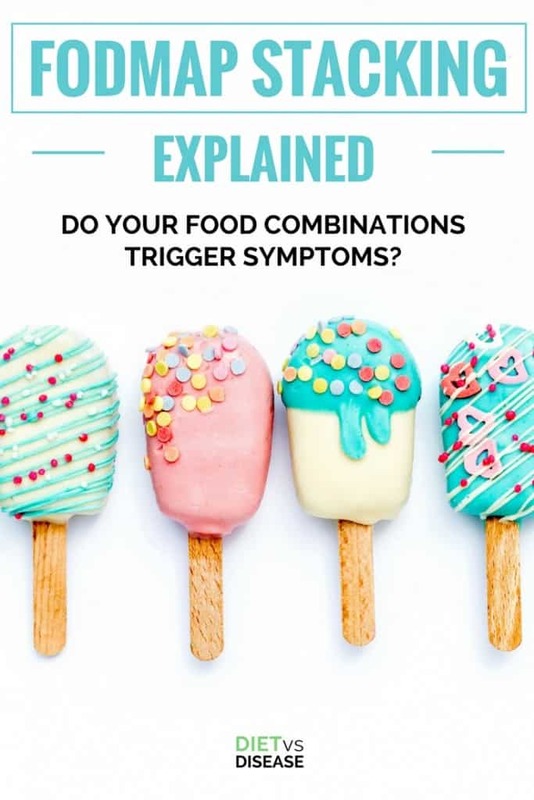 FODMAP Stacking Explained: Do Your Food Combinations Trigger Symptoms? Home » FODMAP Diet » FODMAP Stacking Explained: Do Your Food Combinations Trigger Symptoms? Have you been on a strict low FODMAP diet yet experienced minimal improvement in symptoms? This is not an uncommon scenario, especially if your digestive system is super-sensitive. It’s poossible that FODMAP stacking is the culprit. 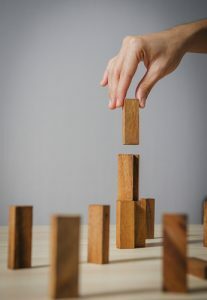 This article runs through what FODMAP stacking is and how to ensure your meals don’t combine too many FODMAPs at once. UPDATE: This article is currently being updated with alternative images to the Monash University phone app screenshots (Monash requested I take them down). As a result, this article may be difficult to use until completed. However, if you already have the Monash app, it will be easy to follow along with it. If you don’t, it can be purchased here. FODMAP stacking refers to when you eat multiple portions of one or more low FODMAP food that contain the same FODMAPs. This could be in a single meal or in meals close together. Remember that even though a food is low in FODMAPs, it still contains FODMAPs to some extent. In other words, most foods are low FODMAP, not no FODMAP. If you eat multiple servings of those foods at once, the FODMAPs can accumulate or “stack” together in your digestive system. This amount of FODMAPs can eventually be considered high, and can trigger symptoms. Unlike a food allergy, which is triggered by any amount of exposure, a food intolerance (such as FODMAPs or a food chemical intolerance) is dose-dependent. In other words, symptoms won’t occur until the amount you can tolerate is exceeded (known as your personal threshold). At a certain dose (portion size) your symptoms will be triggered if you are intolerant to that particular FODMAP (1). The purple spikes represent each time you eat something with FODMAPs. 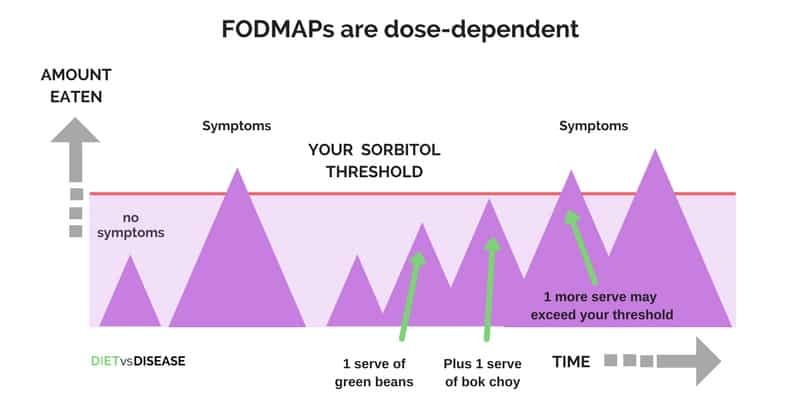 Eating a high FODMAP food or an exceedingly large portion of a low FODMAP food is represented by the big purple spikes. 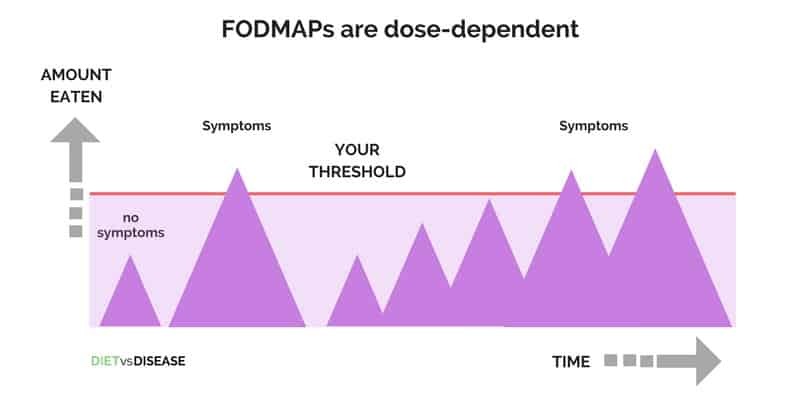 These spikes exceed your symptom threshold (the red line), which is when you will experience digestive symptoms from eating FODMAPs. Having small portion sizes and spacing out your FODMAP consumption helps to keep the purple spikes small, remaining underneath your personal threshold. For example, increased personal, work or school stress will decrease your threshold. This is why gut symptoms occur a lot quicker when you are feeling stressed or anxious. On the other hand, if you’re on vacation or you actively aim to reduce stress through practices like mindfulness, your threshold level can increase. This means that you would be able to tolerate more FODMAPs without experiencing symptoms. Summary: Even if you eat low FODMAP portions, multiple servings at one time can accumulate in your digestive system. This is referred to as FODMAP stacking and can cause symptoms if your threshold for a particular FODMAP is exceeded in this time. You can identify whether you’re FODMAP stacking by checking the FODMAP status of foods in the Monash University FODMAP diet phone app. Unfortunately, we cannot display screen shots demonstrating these examples due to copyright, so if you haven’t done so already, you will need to purchase download the app before continuing. Once downloaded, you can enter the Food Guide section of the app and it lists all the tested foods and their overall FODMAP rating using a traffic light system. When you select a particular food within the Food Guide, you will see a short paragraph below that often describes the FODMAP content of the food in more detail. The app states that 1 serve of beans, which is 15 beans or 75 grams, is low FODMAP in all FODMAP subgroups and should be tolerated by most individuals with IBS. However, when you scroll down frther, it states that serves greater than or equal to 125 grams or ~17 beans contains moderate amounts of sorbitol. This means if you consume around 17 beans or more in one meal or within 2-3 hours, the sorbitol content is high enough that the beans would no longer be a ‘safe’ low FODMAP portion. So if you eat two serves of green beans, the sorbitol will “stack” and you might experience symptoms if your threshold for sorbitol is low. Likewise, bok choy is low FODMAP at 1 serve, which is 1 cup or 75 grams for all FODMAP subgroups. However, larger servings of more than 1 1/3 cups or 112 grams contains moderate amounts of sorbitol. Now if you were to combine one serving of green beans and one serving of bok choy together in your meal, then sorbitol will “stack” and that meal will be closer to your threshold. Fortunately, it likely won’t cause symptoms as most people can tolerate multiple serves of these low-FODMAP foods at each sitting or within 2-3 hours without triggering gut symptoms. However, if you were especially sensitive to sorbitol, the combination and accumulation of sorbitol from green beans and bok choy may exceed your personal threshold and trigger gut symptoms. Summary: Check the Monash University FODMAPs app to determine if you may be unknowingly “stacking” FODMAPs in one meal or within a short time frame. If you have been strictly following a low FODMAP diet but still experience symptoms, this could be why. Some vegetables contain zero or trace amounts of FODMAPs. These are referred to as FODMAP ‘free’ foods because they can be eaten freely without needing to worry about portion size or stacking. Some examples of ‘free’ vegetables include arugula (rocket), red bell pepperS (capsicum) and kent pumpkin. You can see a full list here. If you’re super-sensitive and need to consider FODMAP stacking closely, the free vegetables should be a staple of your meals. Summary: Foods that contain zero or trace amounts of FODMAPs, known as ‘free’ foods, don’t add to the stacking effect. This means you can eat more than one serving of food with the “green light”, but it doesn’t state exactly how many. To our knowledge there is no definite rule here as it depends on your individual tolerance to a particular FODMAP, among other things. If you need to consider FODMAP stacking to help with symptoms, we recommend keeping two serves of low FODMAP foods in a meal and swapping out the rest for FODMAP ‘free’ foods. It’s a conservative approach, but it’s safe. We’ll keep the ½ cup of carrot as this is a FODMAP ‘free’ vegetable. We can also keep the ½ cup courgette (zucchini) and 1 cup broccoli, which are both a low FODMAP portion size. However, now we’ll swap out the remaining ½ cup green bell peppers (capsicum) for another ‘free’ vegetable, such as red peppers (capsicum). This means now we are only stacking courgette + broccoli, rather than courgette + broccoli + green bell peppers. The chicken can remain of course as it does not contain FODMAPs (unseasoned meat and seafood do not contain FODMAPs… thank goodness). Summary: Stick to two serves of low FODMAP foods in one meal, and swap out the rest for FODMAP ‘free’ foods. FODMAP stacking is the term used to describe when you eat multiple portions of the same FODMAP in a short space of time. 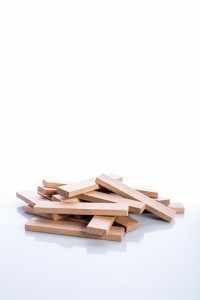 If your digestive system is extra sensitive to FODMAPs, unknowingly stacking FODMAPs could trigger symptoms, even if you are following a low FODMAP diet correctly. In saying that, you only need to consider FODMAP stacking if you’re following a low FODMAP diet correctly but still suffering symptoms.